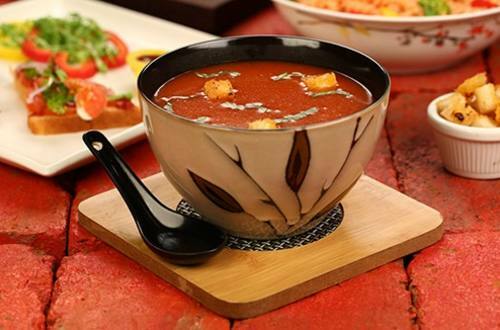 Our thick and traditional tomato soup with an add on of fresh green peas. 1 Heat oil in a saucepan and add chopped garlic, salt and carrot. Sauté for a minute. 2 Add water and mix in the Knorr Thick Tomato Soup. Stir continuously. 3 Add fresh basil and simmer for 4 minutes. Once done, cool completely. 4 Add this soup mix to the blender to obtain a smooth consistency. 5 In a sauce pan, add this blended mixture and cooked chickpeas. Boil for a few minutes. 6 For a nice crunchy texture, add crispy air-fried croutons. 7 Garnish with basil leaves. Serve hot and enjoy!